As a device, a chicken tractor couldn’t be simpler. It’s really just a mobile chicken coop that can be easily positioned in different parts of your yard. This allows your birds to feast on brand new patches of grass every few days. Moving your chickens around not only prevents the patch of land under the coop from getting denuded of grass, it also helps your entire lawn be healthier and look better. Chicken poop is full of nitrogen that can keep the grass looking green, and chickens enjoy snacking on the pesky bugs that love to chew up your flowers. Best of all, the scuffling actions that chickens naturally make when searching for food helps to tear up your soil and keep it aerated, meaning that letting your birds roam in a chicken tractor is one the best thing you can do for your lawn. 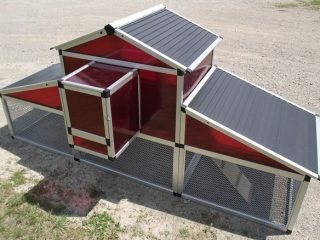 Clearly, getting a mobile hen house for your backyard flock needs to become a high priority. Building a mobile chicken tractor is simple if you know what you’re doing, but, thankfully, for the rest of us ready-made options are available. Also, when you look at the cost of materials and the time it would take you to build a tractor, it oftentimes makes more sense just to buy one instead. Most pre-made chicken tractors kits come ready to use and include everything that your birds need to thrive, including roosting space and nesting boxes. The coops for sale on Amazon highlighted below are some great options for a small flock and are a good representation of what some of the market options are right now. If you want a chicken coop on wheels that still looks classy, this option from Pawhut makes a lot of sense. With this coop, the term “deluxe” is well used- the design comes with a multi-level living space for your birds and plenty of room for them to peck and forage beneath their indoor roosting area. This design is big enough for two to four birds and is made from high-quality fir wood that should last you for several years. Even though it is a large chicken tractor coop, the entire structure weighs about 50 pounds, which means you can easily move it as a single person. Keep in mind that the coop is sold as a kit, so lots of assembly will be required for you to get it to look anything like the picture. Tongue and groove treated fir lumber is used to ensure that this cute log cabin style coop is top quality and ready to last your feathered flock for years to come. A lockable nest box ensures your breakfast stays safe from outside invasions, and the slide-able metal tray makes cleaning easier than ever. 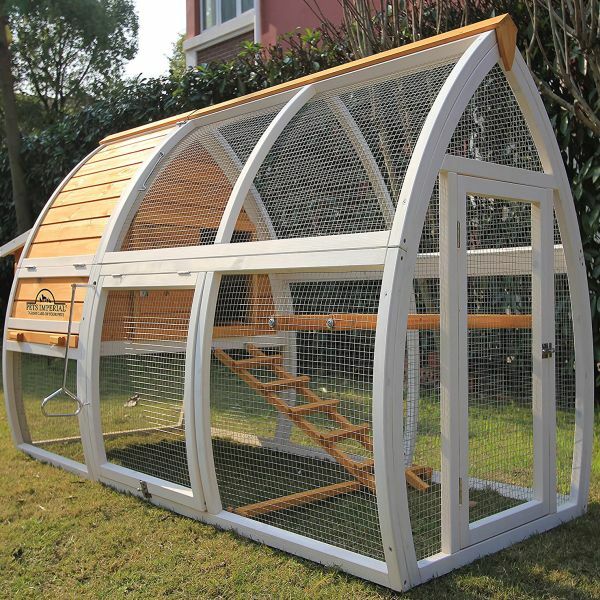 Built to hold 12 hens or 18 bantams, this coop is also designed for ducks or rabbits. Wheels make it easy to move wherever you want to use it, ensuring that your yard stays fresh and fertilized. Some assembly is required, and the coop comes with simple to understand instructions. It’s a little on the pricy end, but it also is higher quality than many movable chicken coop options on the market, so this is a coop you’re definitely going to want to consider. Give your birds the outdoor space they crave with this cute, contained coop that comes complete with a 3-hole nesting box. The fully mobile design is easy to move wherever you want to use it, and the foam grip handles ensure you won’t strain yourself in the process. 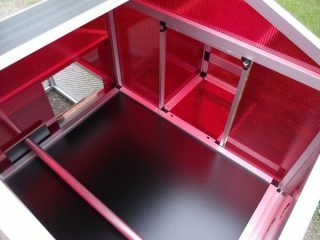 The welded wire top provides ample protection against predators, and the triggered latch gate allows you to have easy access for feeding and watering your flock. Designed to hold up to nine chickens, the coop is designed with everything the backyard chicken enthusiast desires. 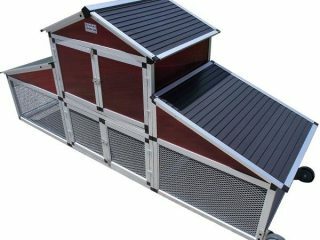 You know your birds deserve nothing but the best, so make sure to invest in Pawhut’s premium coop that’s as cute as it is functional for your favorite fowl. Complete with a nesting box and safe backyard run, the coop comes with a water-resistant roof to keep your birds safe from all weather conditions. The side nesting bod makes egg retrieval easy, and the bottom pan slides out for instant cleaning without effort. 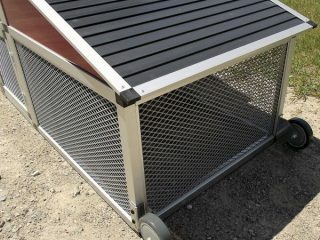 Equipped with wheels to make moving easy, this coop has lockable metal bolt doors and a galvanized wire top to protect animals from predators. To top it off, the green and white coloring make it the perfect addition to any backyard homestead. A small chicken tractor for affordable price. If your goals for a coop is that it be small, simple, and overall CHEAP, then this A frame chicken tractor (also known as triangular coop or chicken ark) might be the right option for you. It’s pretty small and won’t fit more than two or three chickens, but that might make it the ideal option for you if you live in an urban area. The fir wood in this coop is high quality and should be able to withstand bad weather for several years. Seven square feet of living space means that your birds will have plenty of yard to peck over, so long as you commit to moving this coop frequently- which, at 25 pounds, couldn’t be easier to do. Note: Because this design is minimalist, it doesn’t have nesting boxes or a roosting area for chickens. For this reason, it is a better “playtime coop” than a coop that they would spend the night in. 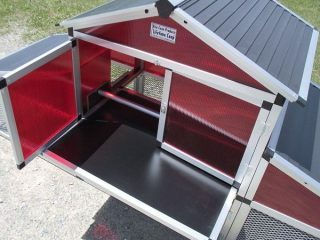 For the best effect, you can put your chickens in this coop everyday after they have finished laying, or around noon. Getting involved with the urban farming trend has never been easier, thanks to this fantastic mobile chicken house option by Pawhut. 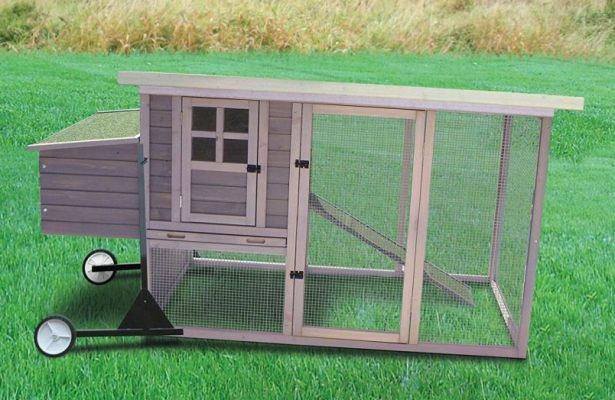 Large and spacious, this coop can comfortably fit half a dozen full sized chickens, giving them all plenty of space to roam and roost within the coop and outside area. Best of all, this coop comes with wheels, making it easy to move around your yard, ensuring that your chickens don’t turn their pen into mud and can instead find tasty insect treats to turn into nutritious eggs for you. Safety and ease of use are Pawhut’s biggest priorities, and your birds will be sure to stay safe from even the most persistent predator. Even clean up will be a snap with the easy clean removable roosting tray. Both stylish and functional, this is the kind of cool chicken coop that you will want to display in your yard. How to make a chicken tractor from your old coop? Do you love your chicken coop but hate the stress it puts on your lawn? Do you wish there was an easy way to move the coop around to ensure that your chickens get to peck at a different patch of grass every few days? If you have difficultly committing to a single location for your chicken coop, this set of wheels for your chicken coop by Precision Pet might be the answer to your problems. When added to the bottom of a coop, the coop becomes fully mobile, meaning that you can move it every few days to ensure that your birds get the benefits of your entire backyard for their consumption. With the extra fertilizer added by your birds, your lawn will never look better- and nor will your breakfast. Weighing less than 14 pounds, this mobile coop add on can be used with any standard sized chicken coop. If you want a minimalist, space efficient coop that doesn’t have the “farmhouse” feel that so many others have, you’re going to want to take a second look at this coop option from Pawhut. Constructed from durable, non-toxic fir wood, this coop is easy to access for humans while still staying comfortably cozy for up to four chickens. At only 19 pounds, it will be a cinch for you to move all over your yard to keep your birds as happy as can be. Though many people wish their birds could be completely cage free, this isn’t realistic for most living situations. If you live in a neighborhood with lots of predators (dogs can be just as dangerous as raccoons and coyotes) your birds will be at risk. Letting your chickens live in a permanent coop that they can get out of during the day is a smart idea, but your birds will still be tempting for predators. The best compromise is to put your birds in a chicken tractor. They won’t be free to roam wherever they want, but they will be kept safe while having access to the ground to peck at as they please. You’ll need to buy less food for your birds if you let them spend time in a movable chicken pen. This is because they’ll be able to supplement their own diet with whatever they can find on the ground around them. The extra nutritional content that they will be taking in from a more varied diet also means that their eggs will be healthier- so the benefit for the chicken will get passed right on to your breakfast! Because you can move a chicken tractor to wherever you want it to be, you can keep your birds safe even during nasty weather. Keep your mobile coop under a tree when the sun gets too strong and find a covered roof when it starts to downpour. Your birds will appreciate the effort that you are putting into them. Surprisingly enough, you can move a chicken tractor right into your garden beds. As the chickens peck and dig through the soil they will also be pooping, meaning that you’ve moved the fertilizer right where it’s needed. Not only are you saving yourself work in the long run, your chickens will have a blast pecking around, aerating your garden soil and eating the pesky insects that have been bothering you all summer long. The best time to put your tractor in the garden is in the fall after you are finished harvesting from it. This also gives the soil a full season to break down some of the nitrogen in the chicken poop. This is important because chicken poop has a concentrated level of nitrogen, and it can burn plants when applied too fresh. An extra benefit of the chicken coop tractor is that they prevent chicken poop from building up in one spot and creating high levels of ammonium that can damage sections of your yard. You don’t want too much manure in any one spot because the nitrogen levels will get too high and it can be a danger for your plants. By frequently moving your birds around in their chicken tractor, you can be sure that your garden soil is getting built up with potassium, nitrogen and phosphorous without getting too overloaded in any one spot. Taking care of chickens in a portable chicken tractor couldn’t be easier. All you need to do is collect the eggs every day, make sure the birds have enough food and water, and move the tractor to a new place every few days. A wheeled tractor makes this job even easier and allows you to push it yourself without needing too much help. Because chook tractors are so easy to move around, you can keep your chicken coop a lot neater and cleaner than in a regular coop. Since you are moving the coop to a new location every few days, it becomes easy for the ground to absorb the mess the chickens make and you will hardly notice that the chickens have been there. In a normal coop, poop and dust can build up to dangerous levels and put your birds at risk of contracting a disease. One of the biggest complaints that people have about free range chickens is that their birds don’t seem to have a sense for what’s off limits in their yard. Unfortunately, it’s the beautiful garden flowers and young spring greens that chickens tend to find the tastiest. You can keep your precious plants safe AND your chickens happy by letting them live a semi-free range lifestyle in a portable chicken house. Everything that you love stays protected, meaning you’ll also be happier. There are so many good reasons to start using a portable chicken pen. Your chickens will benefit from a healthy living environment and you’ll get to experience a more nutrient-filled yard filled with thriving plants. A movable chicken tractor is the perfect coop solution for every small scale chicken farmer.